Hal Jordan and The Green Lantern Corps #24 review – AiPT! ‘Hal Jordan and the Green Lantern Corps,’ aka epic awesome action and emotion. The epic bi-weekly series Hal Jordan and the Green Lantern Corps from Robert Venditti and Ethan Van Sciver continues this week. The funniest part of all this is how Jordan isn’t even the best part; John Stewart might be the runaway hero we all deserve. He has to make a huge choice this issue, but what it is will shock you. ‘FRACTURES’ part three! Secrets are out and battle lines are drawn. 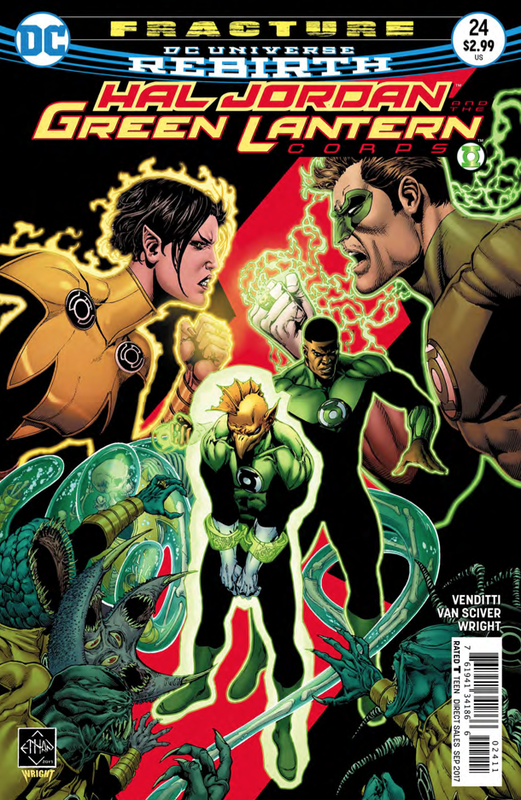 The partnership of the Green Lantern Corps and the Sinestro Corps begins to crumble before it explodes! Venditti did a great job establishing the fact that Yellow Lanterns and Green Lanterns could work together, but judging by recent events it appears he’s tearing all that down. Can these heroes of will and fear work through this? I’d say no! The truth behind a Green Lantern’s terrible choice comes boiling to the top, and it serves as a great way for the alliance to end forever. Oh, and Kyle Rayner kinda told his ex that they had a baby, it came back from the future and was super evil. Yikes. Venditti takes all these plots and has them build towards a rather dramatic end in this issue where there’s seemingly no way this ends outside of all out war. It’s the kind of drama the Green Lantern Corps needs, especially since Venditti has been building the alliance between Green and Yellow for so long! This issue breaks down into three dramatic scenes, each having two characters go at it with all their emotions and/or clever manipulations. Emotion has always been a big part of Green Lantern and Venditti uses it here in full force. There’s regret, anger, fear, hate, and more all on the page in this issue. It’s a lot to take in–it’s certainly high drama–and it’s enjoyable. Sciver draws another great issue, with every alien looking realistic and creepy in a way that helps sell the story well. In an awesome scene where Hal Jordan refuses to believe a Green Lantern killed, Sciver draws in great detail Jordan almost scared, and then in the next panel flipping angry. It’s a cool way to show how hotheaded Hal can be. In the two full page spreads above and below, Sciver makes a Green Lantern’s choice very cool looking, but also incredibly dramatic. There’s no doubt about it when Sciver draws this book it’s more epic than you can imagine. While Sora’s scenes are incredibly emotional, they’re also pretty packed with dialogue, meaning little action. This scene between her and Kyle drags a bit, especially since it’s mostly about talking about things that happened in previous issues. It also seems quite reactionary of her, especially when she’s always been a level headed leader. We’ll see where this goes from here, but things dramatically turned and they seemed to have done so so that everything can come to a head at an opportune time. This is an epic series of emotion and action. Venditti and Sciver are carving out quite an awesome series that showcases the powers of these great characters. Epic moments and emotional ones too. Things come to a head as everything Venditti built could end soon! Whoa, some epic splash pages!